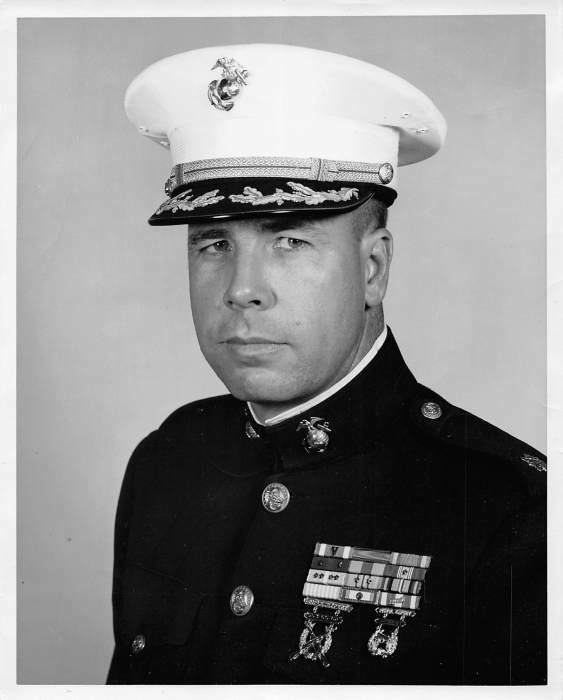 Major Edward Joseph Chapman, USMC, loving husband and father, died on November 21, 2018, at age 88, surrounded by his family. He was born to Edward and Leola Chapman on February 14, 1930 in Glens Falls, New York, then moved with his family to Boston Massachusetts at age four, where he graduated from Boston Trade High School. He was active in the South End Boys Club athletic program which started his lifelong love of sports and coaching. His skill as an athlete led to basketball and baseball scholarships, and he was drafted by the Brooklyn Dodgers with the opportunity to begin a career in professional baseball. But, in 1950 he chose to serve our country and enlisted in the Marine Corps. He served on the front lines in critical positions in Korea and Vietnam where his dedication and leadership led to promotions as an officer, and commendations for his bravery with numerous ribbons and medals. His career in the military included major roles such as the development and installation of defenses in Guantanamo Bay, Cuba. In 1953 he married Rose Nicholson and raised four children. He retired after 22 years of service and continued his career as Senior Executive of Risk and Security Analysis for the IRS, Wang Laboratories and Fidelity Investments and as a consultant. Edward’s love of coaching continued in his civilian life with coaching Wilbraham Youth Baseball and Softball, Minnechaug High School Girls Basketball, and ran the St. Cecilia’s CYO Basketball program. He is remembered for mentoring and inspiring many of his team members. He was also involved in Wilbraham Public Access and televised Mass for St. Cecilia’s church. Edward is survived by his wife of 65 years, Rose, and children Kathleen Chapman of Glastonbury, Connecticut, and her husband Bruce Baker and son Terence Kohn and his wife Siri; Diana Chapman of Salem, New Hampshire and her husband James Sears; Edward Chapman of Westwood, Massachusetts and children Blake Chapman and Devin Chapman; and Sharon Chapman of Wakefield, Massachusetts and her husband Edward Russo and children Alison Miller and Cali Russo. He also is survived by two great-grandchildren, Caitlin and Lillian Kohn and cousin Joyce Williams and her family. Calling Hours will be held on Tuesday 11/27/18 from 4:00 pm to 7:00 pm at Wilbraham Funeral Home, 2551 Boston Rd., Wilbraham. The funeral will be Wednesday at 9:30 am from the Wilbraham Funeral Home to a Mass at 10:30 am at St. Cecilia’s church in Wilbraham, followed by the burial at the Massachusetts Veteran’s Cemetery in Agawam. In lieu of flowers the family is requesting contributions to the Navy-Marine Corps Relief Society, attn. Development, 875 N. Randolph St., Ste. 225, Arlington, VA 22203.